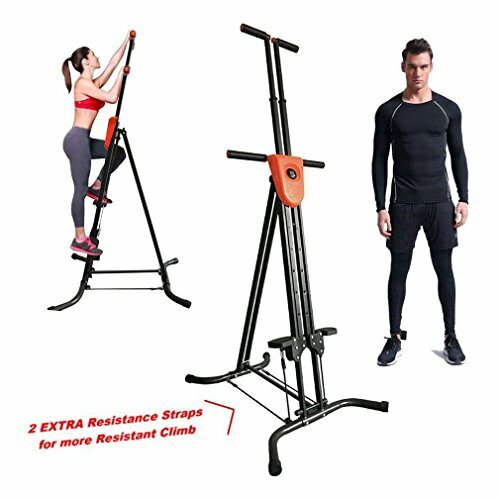 Coldcedar vertical climberis the affordable, calorie-blasting, body sculpting workout that enables you to perform both cardio and muscle toning all in the comfort of your own home. It works your lower body, core and upper body muscle groups at the same time, maximizing your time! Digital display design that can show result of exercise time, speed, distance and calories after your workout. You can workout your hips, thighs and arms. It can be foldable that for easy storage and save your space. Get perfect shape,lose your weight. It can burn your calories and make your muscles stronger. 2 Resistance Bands Straps for Extra Resistance for advance Climbing option. Help to keep fit and one who wants to lose weight. The machine is so stable and in high performance. ✔️ FULL-BODY WORKOUT, combines calorie burning cardio with muscle toning in one simple step. A great alternative to jogging, running or hiking. Vertical Climber works your entire body, sculpting leaner legs, toned arms, rock-hard abs and more. ✔️ FOLDING & DURABLE: Adjustable height and durable steel frame can easily fold up for storage, saving space, supporting up to 286 LB. You can put it in the corner when you not use. Easy to assemble. ✔️ LCD SCREEN: LCD screen could tracks your time, speed, distance, and calories burned. ✔️ SAVES TIME: Our vertical climber is designed for effective whole body training to build muscle and endurance. No need to drive to the gym and use several machines. Low impact workout, easy on the knees and ankles. ✔️ BONUS: 2 Resistance Bands Straps for Extra Resistance for advance Climbing option. If you have any ambiguities, please do not hesitate to contact us, or ask the professionals.